The Three Peaks challenge is undoubtedly the UK’s leading challenge event - and for good reason. The journey takes you from the wild beauty of the Scottish highlands, through the quiet majesty of the Lake District, finally culminating in rugged Snowdonia. I was lucky enough to take on the challenge last summer and it was quite the eye-opening experience. Here are five things I learnt from my trek. 1) The UK has phenomenal scenery. The Three Peaks challenge offers ample opportunity to see England, Scotland and Wales’ best and most beautiful spots. We kick things off in Scotland with the highest peak in the British Isles, Ben Nevis. The drive to ‘the Ben’ is awesome: you’ll whizz past delicate waterfalls and huge craggy munros, set against the expansive highlands sky. 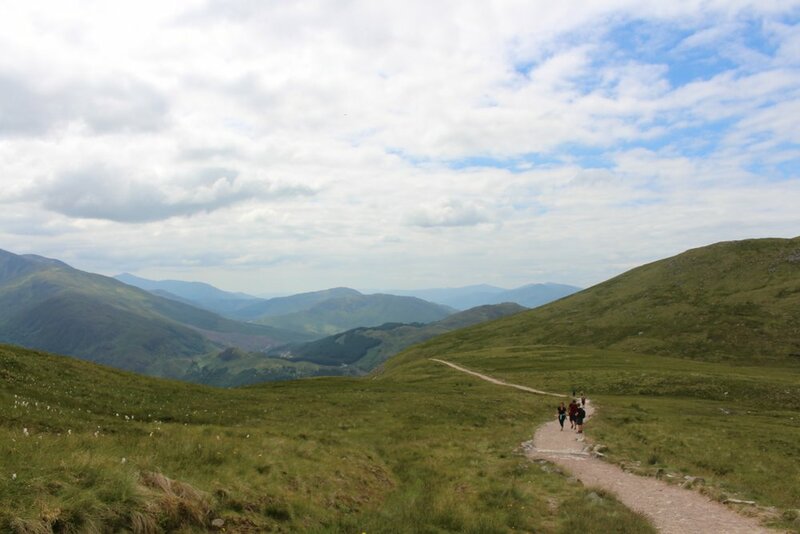 The trek itself is gorgeous - on a clear day you’ll be treated to panoramic views of the surrounding lochs and mountains. After the beauty of the Scottish Highlands, it is then England'‘s turn to impress. Whilst you drive through the night to get to Wasdale Head to tackle Scafell Pike, once you arrive and rub the sleep out of your eyes you’re in for a treat. The lack of light pollution means that the stars are phenomenally clear, and they’ll help guide you to the summit of England’s highest peak in time for sunrise. As you approach the summit, your surroundings will begin to emerge from the darkness in an orange glow. Our guides will then point out the spot on the horizon where the sun will rise, and before you know it the whole of the Lake District is lit up beneath you. There is nothing quite as breathtaking as watching the sunrise from England’s highest point! Finally we turn to rugged Snowdon and the Snowdonia National Park. Your morning drive through the quiet prettiness of the Lakes will keep your spirits high as you head toward the finish line. Arriving at Pen-y-Pass you’ll find yourself surrounded by expansive rock faces and rolling green hills, and the trek itself will give you phenomenal views of the local area, including a former copper mine. Climbing 3 peaks in a row obviously requires some serious grit and determination, but as I went into the challenge, this is definitely something I’d somewhat overlooked. With other challenge events out there that take you to a much higher altitude, like Everest Base Camp and Kilimanjaro, it’s easy to feel like the considerably smaller mountains of the UK are going to be a doddle. But don’t forget that you’re actually climbing three mountains back to back, covering 25 miles and you’re climbing upwards of 3000m in total! Your also climbing the mountains at a rapid pace - and multiple descents can be tough on your poor knees! Training is crucial in making sure you not only complete the challenge, but also enjoy it. Well, it is the UK after all! Whilst all our trips depart during the summer, hopefully guaranteeing you some beautiful sunshine, mountains have a habit of rapidly changing weather. You can start off in sunny 25 degrees and by halfway the mist has begun to roll in and ice cold rain means you’re finding yourself decidedly soggy! Ben Nevis in particular can be pretty damp at the top - there’s a reason it translates from gaelic as ‘mountain with it’s head in the clouds’. It does get colder and much breezier at the top of each of the summits, so packing a bag with extra layers and a waterproof is 100% recommended. 4) You can function on very little sleep. Your journey from Ben Nevis down to Scafell Pike is your best opportunity to catch some shut eye during your trek. Battling with sleep deprivation after a few broken hours of sleep in the back of a mini-van is one of the greatest challenges of the Three Peaks. It’s a real mind-over-matter struggle, but if you focus on your end goal you’ll be able to power through. You’re definitely going to learn to cope on limited sleep, and also pick up some new techniques for sleeping in less than ideal situations - a blanket and a travel pillow are an absolute must! 5) It’s all about team spirit! The Three Peaks truly is a challenge, but your team mates will help pull you through. Chatting to and supporting each other massively helps when you’re all on that final ascent of Snowdon - a couple of kind words to someone who’s flagging could be the difference between them summiting or not. There’s also nothing like a difficult challenge to really pull you together as a group, and if you’re supporting each other you’ll find your making fast friends. The Three Peaks is an amazing opportunity to meet different people, not only from your university, but from universities from across the UK. It’s a great way to both extend your social network and build on existing friendships, all whilst completing the UK’s flagship challenge. Does it get better than that? Interested in signing up for the Three Peaks?